'We cannot win peace among our people by treating them like the enemy,' says Mitali Saran. The Pulwama terrorist attack, and the more than 40 CRPF soldiers it killed, is an abominable tragedy, as are all terrorist attacks. Nobody should have to die a violent and/or premature death, including soldiers who voluntarily put their lives on the line. It is the job of diplomacy to ensure that as few soldiers as possible find themselves in harm's way. It is also a fact that even with the best diplomacy, the best policy, and the best-intentioned engagement, there is no foolproof way to prevent terrorism not even with the best allocation of resources, the best technology, and the best intelligence. Ask the United States. Ask the United Kingdom. Ask Spain. The best that these 'bests' can do is minimise terrorism and they do. But when one part of the country suffers disproportionately from terrorist attacks, causing a disproportionate loss of armed forces personnel, it is fair to say that we are not giving it our best. The hard-earned, fragile calm in Kashmir has unravelled again over the last few years; according to the IndiaSpend data, there have been 1,708 attacks in Jammu and Kashmir since 2014, accompanied with a 94 per cent increase in armed forces fatalities. And because the 'Kashmir problem' is difficult to fix, because we keep failing, it seems easier to blame and demonise the people. You cannot say the following three things simultaneously: That Kashmir is an integral part of India; that India is a democratic country based on the rule of law; and that Kashmiris are treacherous anti-nationals who should be persecuted. Pakistan's destructive influence in Kashmir rides on unresolved Kashmiri grievances. While we certainly need to effectively push back against Pakistan, that diplomatic and/or military effort will be incomplete at best unless we also engage with the disaffection among Kashmiri Indians. We cannot win peace among our people by treating them like the enemy. Every loss of armed forces personnel is terrible, but we cannot lose sight of why those lives are on the line in the first place: To protect not just the territorial integrity of India, but also the Constitution of India -- it's right there in the CRPF oath of service. There is only one way to make those soldiers's deaths worse, and that is to rob them of meaning by allowing a hysterical nationalism to hijack the narrative and, under cover of grief for fallen soldiers, turn India against ordinary Kashmiris. In the name of nationalism, Kashmiri students were being thrown out of their colleges in Dehradun, Kashmiri merchants were being thrashed in Delhi, Kashmiri workers were fleeing mob fury in Muzaffarnagar, and some hotels in Agra put up signs directing Kashmiris to stay away. In an appalling perversion of duty, Meghalaya Governor Tathagata Roy, who is a Constitutional representative of India's President, endorsed a call for Kashmiris to be boycotted. In the name of nationalism, we are asked to remain silent as fellow Indians who have nothing to do with Pulwama are treated like hostiles. In the name of nationalism, it is never the right time to ask questions of the government about security lapses, about why the prime minister did not attend the all-party meeting following the attack, and how he reconciles his warm reception of the Saudi crown prince with his tough stand on terrorism. It is to the government's credit that China has been forced to censure the attack and the Jaish-e-Mohammed (albeit belatedly, and without naming the Jaish's leader, Masood Azhar) that is a step in the right direction. Why, then, is the prime minister also stoking "the fire that burns in your hearts" rather than seeking to calm the irrationally vengeful? In the name of nationalism, we are hostage to competitive grieving, and competitive rhetoric regarding the military. Ask yourself, why this virulent nationalism, at this particular moment? Why a 'nationalism' that closes ranks against its own people? Why a nationalism that treats a military and human tragedy like low-hanging electoral fruit? In the chaos created by volume over substance, it is easier to blur the distinction between 'Kashmiri' and 'Muslim', and easier to draw a line from 'Muslim' to 'terrorist'. If you find yourself burning with righteous rage that can only ruin more lives and spill more blood, dear reader, stop and ask yourself how much you're being played. 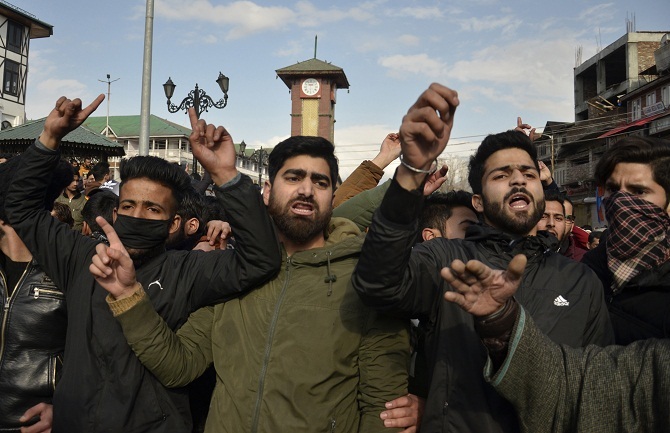 Those who invoke those flag-draped coffins to incite hatred should take a cue from the CRPF itself, which set up a helpline for Kashmiris in distress, and created a fact-checking team to debunk the fake images and videos being circulated to rouse passions. How many more suicide bombers are there?